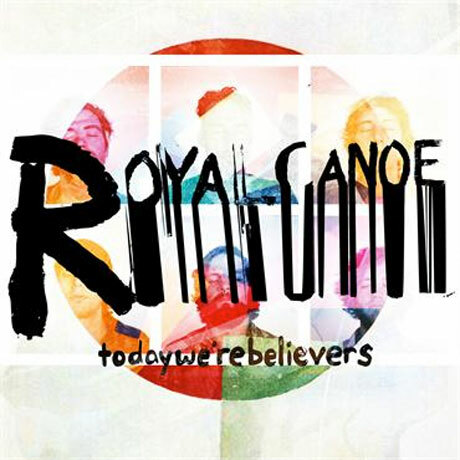 Winnipeg indie-pop six-piece Royal Canoe recently announced they had signed on with Nevado Records to release an upcoming LP, and the band have now delivered the details on their first full-length. Titled Today We're Believers, it arrives June 25 via Nevado in Canada and Roll Call in the U.S.
A press release notes that the 12-song set, which follows their two 2012 EPs Extended Play and Purple and Gold, continues to display the outfit's "dedication to crafting a seamless musical pastiche" by blending a ton of different musical styles while still sounding cohesive. Apparently, the eccentrically hybridist song cycle's "aggressive energy" was inspired by Manitoba's extreme weather shifts. You can sample the title track, which places Prince-styled pitch-shifted vocal harmonies alongside a low-key bass bounce and open-air keyboard washes, in the player down below. As previously reported, Royal Canoe are playing some shows in Canada with Rococode this month before they head off for Europe. You can see the tour itinerary beneath Today We're Believers' tracklisting.